The Samsung Internet browser has crossed an elusive milestone on the Play Store: the app has been installed more than one billion times. It was only 12 months ago that Samsung Internet breached the 500 million installs mark, and the latest figure puts it ahead of both the Firefox and Opera browsers for Android devices combined. The fact that Samsung Internet comes preloaded on Galaxy smartphones has helped it achieve the 1 billion milestone, as every new device that gets activated counts as one install. Since Galaxy smartphones sell considerably more than devices from other manufacturers, the Samsung Internet app is likely to retain the top spot for years to come as far as the install count is concerned. Of course, that’s not counting Google Chrome, which will always stay ahead as it’s popular as a browser on both mobile and desktop and also comes preloaded on all Android devices. Samsung Internet is available for all Android devices as well (Android 5.0 Lollipop and above), and it’s also one of the most feature-packed browsers on Android. Plugins/support for extensions is perhaps its biggest draw, in addition to Samsung-exclusive features such as iris sensor authentication on websites. The app has also had excellent performance for a long time, better than Google Chrome based on our experience. 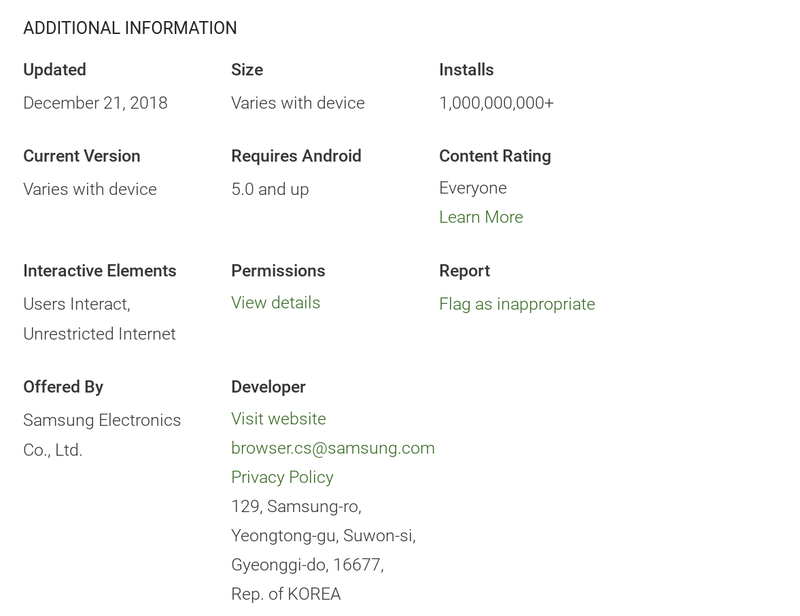 Last but not the least, Samsung actively adds new features and improvements to its proprietary browser app, more so than any of its other apps that are available on the Play Store. They will bring it back in next updates. The updated version lost the QR Reader feature. I will stay with the samsung browser when it incorporates page translation, just like chrome does. Still hoping Samsung brings their Browser on Desktop in the future, to have an alternative to Chrome. Really like the Samsung Browser on my Phone.